This is one of those recipes that I've been saying I'm going to try out forever, but was, for some reason, intimidated. I researched a number of recipes online, decided what flavor combination I wanted, gathered the ingredients, and then never made them! Then, the other morning, with the Verizon guy here, Richie still palling around the apartment, Bar pulling at my pant leg, I decided it would be a good time to try. And they turned out AWESOME! They were actually super quick and easy to make (though a bit messy). No bake! No dehydrate! Just refrigerate! These will definitely be on the menu more regularly and I'll experiment soon with other flavor options (I'm thinking a chocolate nutbutter option...!). And mix until it forms a dough then set aside. Put the cinnamon sugar into a small bowl. Take about 2 tablespoons of dough in your hand and roll into a ball. Place the ball into the cinnamon sugar bowl and roll it around until it is totally covered. Place it on the sheet pan and start over. These are sugar free, gluten free (if you use gluten free oats), vegan, and raw. They are a totally healthy and delicious snack or dessert. Richie love loved them and so did the kids!! It is no secret I've been experimenting with paleo meals. No meat for me, of course, but eggs have snuck into our menu. And it creates an opportunity for more nutrient packed, clean desserts. These muffins are protein packed, organic, clean, mean, delicious, and the absolute perfect project for a snowy snowed in day. 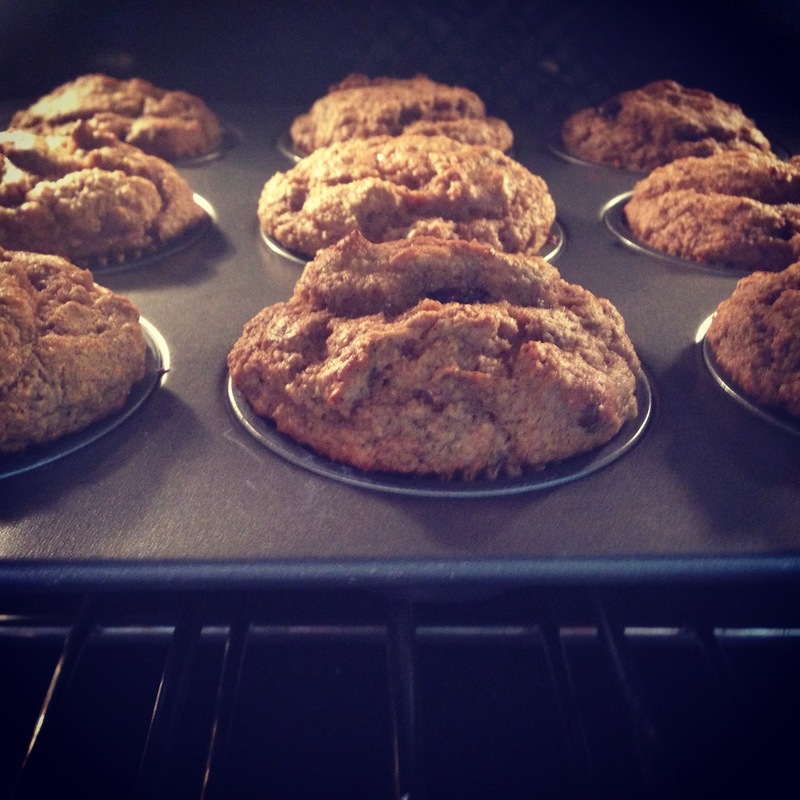 Preheat the oven to 350 degrees and prep your muffin tins (this makes 12 big guys). My vegan diet was amazing for a very long time. It treated me well and took very good care of me. But as many of you know, before I had Bar, I had a few miscarriages which led to a number of blood tests which led to finding out that I have a problem synthesizing B vitamins. So eggs needed to be on the menu. Always cage-free, organic, local. Mostly from the farmer's market. And I felt good eating them, so I continued past my pregnancy. Then after recovering from Bar, most of you also know, I fell into the abyss of SoulCycle. And now I'm instructing. With all of the exercise in my life, I needed more protein. And though I believe that many people can get more than sufficient amounts out of a vegan diet, my body was telling me I needed more for proper muscle recovery. So fish (mostly salmon, almost always wild, Norwegian) is also on the menu. Soooooooooo...paleo desserts are a fantastic option. And these brownies are nothing short of amazing delicious. They are a variation of these, just a little less sweet and with more add ins! 2. Put everything into the bowl of a mixer (preferably wet ingredients, mix, then dry, but not necessary). 4. Coat a brownie pan with coconut oil. 6. Bake for 25-30 min or until cooked through and just starting to brown at the corners. In my humble opinion, the perfect chocolate chip cookie is equal parts crispy and chewy and sweet and salty and chocolatey and nutty. For me, it's also whole grain and sugar-free and made with nothing refined or processed. Not an easy feat. But after what seems like endless batches of yummy, but never perfect chocolate chip cookies, I think I may have perfected it. And I didn't share it for a while (sorry) cause I wasn't 100% sure until I'd duplicated it a number of times. In a mixing bowl, combine the flour, flax, baking soda, xanthan, and salt. In a separate bowl, mix the oil, apple sauce, vanilla, rice syrup, and coconut sugar. While mixing, slowly add the dry ingredients to the wet until totally combined. Add the chocolate chips and walnuts and mix until incorporated. Place cookies on a baking sheet lined with parchment paper and bake for 9 minutes, then rotate, and bake another 9 minutes. Allow to cool enough to touch then transfer to a cooling rack to cool the rest of the way. A while back I posted a vegan, pumpkin cornbread here. It was gluten-free and really yum, but honestly, not fantastic. The flavor was good, but it was a bit crumblier that I would have liked. I wanted a more moist version that would pair well with my soups or chili or even some Jamaican style rice and peas, so last week I set out to make some. I lucked out and hit the nail on the head on the first shot! It was flavorful and moist and totally delicious! Line a 9x9 or a muffin tin (I use a mini loaf pan cause I think it’s supercute) with parchment paper then coat with coconut oil. In the bowl of a mixer combine the maple syrup, coconut milk mixture, flax, germ, pumpkin, and coconut oil. In a separate bowl, combine the cornmeal, flour, baking soda and powder, salt, and cinnamon. Add the dry mixture to the wet and mix until combined. Pour into pans and bake for 25 minutes. Serve warm with a bit of coconut butter spread or Earth Balance! Vegan Summer Crumble: Peaches, Blueberries, and Strawberries straight from the farm! Last weekend on our way out east to the beach we passed so many farm stands selling fruit pies that were just calling my name. Though they looked fresh and delicious, I'm positive they were filled with butter, sugar, and white flour along with their farm fresh fruits. Way to ruin a good thing, right?!? Bake at 350 degrees for 35 minutes or until crispy and just starting to brown on top. Serve warm or cool. And if you so desire, add a dollop of vegan vanilla ice cream!